Splish splash, I was taking a bath! More like...Splish splash, I was taking a COLD bath. Terry from Team Fun, travelled to the north-east on Sunday to carry out an event hire on our latest exciting product. The Dunk Tank! **cue dramatic sound effect** The Daring Dunk Tank! I'm sure you get the point. **deep voiceover** Do you dare to sit upon the Dunk Tank seat? OK! We get it, shut up. Fun Leisure UK made the trip to Hebburn Sports & Social Ground’s fun-day at the weekend, and even the weather was on our side. Very sunny and fun packed day. A perfect opportunity to showcase our latest outdoor interactive activity – The Water Dunk Tank. It’s ideal added extra to any occasion to make your event stand out from the rest. It’s not often your guests can be involved in such a unique experience. The Dunk Tank is never a standalone (dry) hire. At Fun Leisure UK we supply an easy to understand complete package. The Dunk Tank includes a Fun Leisure operator who will set up, maintain and pack-down the Dunk Tank. Furthermore, you’ll be experiencing our new wow factor branded unit. All you need to show our team where you would like us to setup. 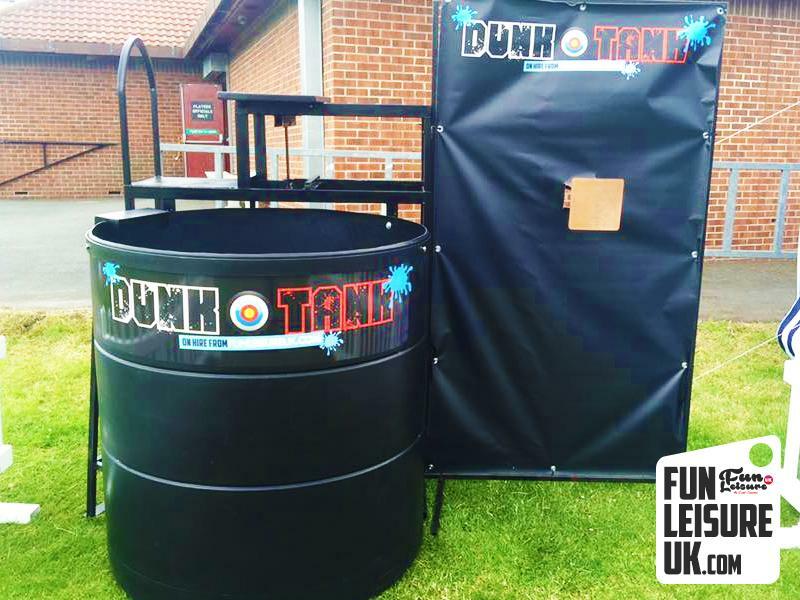 Fun Leisure’s Dunk Tank is a guaranteed winner at many events, creating hours of laughter, suspense and comradery. Our Dunk Tank comes with all the necessary apparatus; water supply must be obtainable. Other website visitors were also interested in these fun products: Gunge Tank, Giant Pie In Face & Fun Fair Side Stalls.